President Barack Obama embarks on his first trip to South and Central America since taking office when he visits Brazil, Chile, and El Salvador starting Saturday. The trip is long overdue. It now offers an enormous opportunity for Obama and the United States. Latin America is booming, with strong growth rates and historic levels of investment. But, most importantly, it is a part of the world with which we share so much in common, including values; an economic model; a strong commitment to democracy, human rights, and economic empowerment; and a belief that a vibrant, entrepreneurial private sector is critical. A successful trip could be measured as one in which Obama and the leaders of the visited countries better understand the shared vision before us. It has the potential to show our neighbors that we can build a partnership based on mutual respect that will endure because it is in the best interest of all parties. 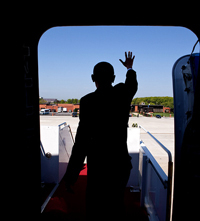 The president will kick off his five-day tour in Brasilia and Rio de Janeiro. This stop in itself is a historic one; both leaders represent “firsts” for their respective countries, with Obama as the first African American U.S. president and Dilma Rousseff as the first Brazilian female president. Rousseff is just months into her presidency and has been vocal about her support for stronger U.S. ties. Obama’s “winning the future” strategy represents a huge opportunity, not just for the United States, but for the hemisphere as well. In Brazil, there will be an official public sector and a private sector agenda—a theme of huge interest to the United States, given that Brazil represents 42 percent of the region’s GDP and just surpassed Italy as the seventh largest economy in the world. Furthermore, its market and rising middle class (36 million people have joined the middle class and 28 million have emerged from extreme poverty in Brazil since 2003) offer a market for U.S. exports. Growing Brazilian infrastructure needs present a huge opportunity for many U.S. companies. Washington can learn from Brazil’s 25-year-plus strategy to focus on alternative energy production while Brazilian social development programs such as its income-transfer program Bolsa Familia serve as a model for poverty reduction. The next stop on the president’s agenda will be Santiago. Chile strives to be the Silicon Valley of Latin America and is taking innovation and entrepreneurship seriously—two goals the president outlined in his State of the Union speech. Through “Start Up Chile,” the government provides $40,000, office space, and network opportunities to early stage entrepreneurs. Such programs showcase how serious the Chilean government is when it comes to turning the country into the innovation hub of the region. The United States and Chile share the value in entrepreneurship and the private sector. President Obama should use our success in this area and build partnerships with the Chilean government and universities to make the Americas more competitive and, ultimately, stronger. The president closes his trip with a stop in San Salvador. President Mauricio Funes has prioritized making El Salvador a country democracy, stability, and transparency as core values. El Salvador’s population is about 7.2 million and an estimated 2.5 million Salvadorans live in the United States. Funes has said he will press the president regarding immigration reform and the fate of Salvadorans living in the United States who enjoy Temporary Protected Status until March 2012. Obama should seek to build a partnership with a Central American leader with a relatively centrist political agenda who is willing to take a stand on combating organized crime. Funes has stated that it is committed to fighting drug trafficking but it cannot do it alone and assistance from the United States has been scarce and slow. Our hemisphere has enormous potential and can prove to be a key that would unlock our economy and create jobs here at home. Latin America and the United States share history, border, and a culture. I hope President Obama’s trip kicks off a new dawn where we join with our southern neighbors and work to our fullest potential.